Imagine you're the only boy in a town of men. And you can hear everything they think. And they can hear everything you think. Imagine you don't fit in with their plans. Todd Hewitt is just one month away from the birthday that will make him a man. But his town has been keeping secrets from him. Secrets that are going to force him to run. I'm a firm believer in young adult novels. I am of the opinion that some of the best stories ever written had a teenage audience in mind. I'm not sure whether this tells of my immaturity, or tiny little mind, or whether it means I just like to be carried away by a story. 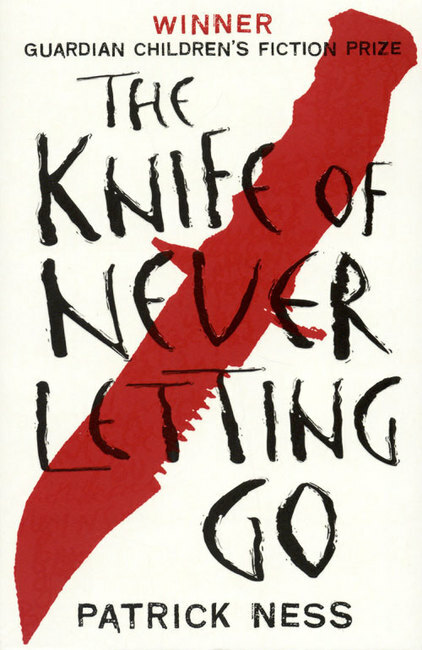 Regardless, The Knife of Never Letting Go is one of these. The story is so rich, so deep, and so dark. The town Todd lives in is inhabited only by males, and is consumed by a germ they call Noise. This makes everyone's thoughts loud enough for everyone else to hear, every thought, memory, and secret is screamed from their person as though they are walking radio broadcasts. The town is never quiet; Noise rules everything. An interesting point we learn of later in the novel (spoiler alert) is that the Noise germ doesn't have any effect on women. I have my own take on why this is, but rather than sounding like a blazing feminist, I'll leave you to ponder that one on your own. Todd is a wonderful protagonist. He is so young and resourceful, full of resolve and determination, yet he is so incredibly flawed. He makes mistakes regularly, beats himself up about them, and ultimately learns from them as a result. We clearly see him becoming stronger in mind as the story progresses, and his growth really appealed to me. The story is written in first-person, from Todd's point of view, in such a way that we can see his lack of education. This, along with his colloquialisms, emphasise his vulnerability, and make him a very endearing and trustworthy character. Noise also affects animals in Todd's world, and their every thought is heard alongside human thoughts. Stories with talking animals are usually very cringey and Farthing Wood-esque, but Ness absolutely perfected the personalities of the animals to make them believable. It really wasn't difficult to imagine animals thinking in the ways Ness characterised them to think. Todd's dog, Manchee, has to be one of my favourite dogs in literature. He has a very limited vocabulary, but his feelings come across clearly. He is absolutely incredible. I'd love a dog of my own who would run alongside me and shout, "Poo, Jenna!" Ness writes of colonisation and group mentality, and shows us these as very scary concepts indeed. I think these are good themes to bring up in a young adult novel; although younger readers may not immediately relate these to current events in our world, it's good to show the possible consequences of this type of person, or government. 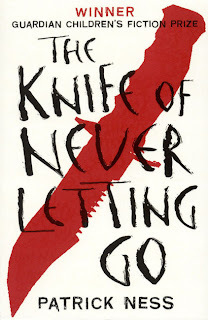 This is a wonderfully dark and compelling novel. The cliffhanger has to be one of the most agitating since Half-Blood Prince. I can't wait to get torn into the next installment of the trilogy. I'd definitely recommend this to all of you.